This thread will be to discuss Orlando, FL's winter climate. Winters have definitely been trending warmer in recent years in Orlando. Vacationing in the area over the last 20 years I've watched the Araucaria get to South FL height and things like bottle palms, rubber plants, and foxtails appear all over the place. Here's an interesting web page that shows the annual low for each year in Orlando back to 1894. The recent warm trend seems to start around 2004, after which getting to the upper 20's or even below freezing (the last 10 years) has become rare (sans a couple notable outliers). Before this period, it appears that one could generally count on getting to at least freezing each winter. January 2018 (around 27 degrees in much of Orlando) finally broke the pattern after an impressive stretch of freeze-free winters since 2011 (the notable brown Dypsis lutescens and Mango trees after Jan 2018 attested to this). That winter is what I imagine being a more typical one this area would experience historically. I had wondered if the 2018 winter was going to be the beginning of a break from this nearly freeze-free pattern, but if this winter doesn't get any colder than it already has (at 39 deg), it looks like that may not be the case. While I know the urban heat island effect has contributed to moderating, I wonder how far out it can protect from closer to the inner part of the city. I think part of this area's luck has been there simply not being a trough that has come far enough south and oriented in the correct way to give a hard freeze south of N. Central FL. A recent good example being this winter with the January Polar Vortex event which indeed gave record breaking temperatures as hadn't been experienced in decades farther north, but was broad and simply didn't stretch out to the south. It's been quite interesting moving here from Northwest FL; because there, even in the warmest of winters, it always goes below freezing: frost sensitive annuals and tropicals (planted as annuals) are killed back, and the perennials die down and come back in spring (true to their namesake). But in Orlando, people plant out such tropicals and annuals year round, making the difference between a warmer winter and a colder one much more crucial as it rides along that freezing mark (at least in recent years). That fine line is so much more critical here. Also what makes this area unique is that perhaps more than any other place in the world, a recent 15 year trend of slightly warmer temperatures has such an effect as to bring in plants from a totally different climate zone (at least ones that are truly tropical/largely intolerant of freezing temps i.e. Cocos, Ficus, Hyophorbe, etc...). What makes this occurrence more of a spectacle is seeing such plants next to native vegetation; much of which are the same plants and trees you would see in North FL or even Southern Georgia. To see a royal palm growing next to a Sycamore tree is quite a sight. And then on the other side, about 40 years ago, the pattern snapped into a cold zone 9 or even 8 climate for around a decade. I'm currently reading John Attaway's book: "A History of FL Citrus Freezes," and still can't get over some of the lows that occurred (for example, 14 degrees recorded on the outskirts of Orlando in 1985). I might share some other interesting excerpts or data from that book as I continue to read it, or maybe do so in another thread. This area may also win the award for "rollercoaster" temperature swings in the winter months. Looking at daily weather history over the last several decades, so many times there are mid 80's one week and the next dropping into the mid 20's overnight. What struck me after moving here was how quickly the temps skyrocket back to almost summer levels at times as soon as the influence of continental weather systems from up north move away. I do have to admit the climate here is sort of daunting, because it is oh-so-close to being tropical and yet throws out freezes or even very hard freezes very randomly. I've found that one of the best answers for an area's climate lies in the native vegetation. In this case,the longleaf pines, laurel/live oaks, black cherry, Magnolia, and palmetto do give a big clue in the hardiness needed for long term survival. I'll be very interested to see how the winter trends in this area continue to play out. Feel free to share your thoughts or info regarding the Orlando area's winter climate here. 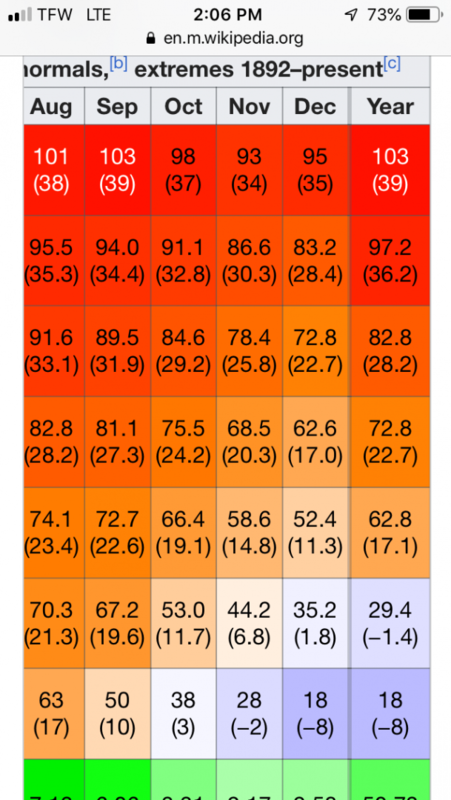 Where are the official temps are recorded ? The core metro Orlando/Winter Park has always been warm. Prior to the first of the 3 mega freezes of the 1980s (83,85,89) there was quite a bit of zone 10 plants around; Ficus, Delonix, Schefflera, Monstera, Dracaena, Pandanus, Spathodea, Casuarina, Mangos, Melaleuca, Araucaria, Ravenala, Dypsis, Caryota, Roystonea, Archontophoenix, big crotons etc. But the 80's freezes also severely damaged or killed zone 9 plants like Citrus, Jacaranda, Peltophorum, Grevillea, Tabebuia, Syagrus romanzoffiana, Phoenix roebelenii, Rhapis, etc. I have also seen old photos from the 1940s and 50s of fruiting Coconuts, (this had to be prior to the 1957-58 freeze). I think the urban heat island has expanded out since the 1990s with growth. It still gets cold just outside of Orlando. I heard from growers west and northwest getting down into the low 20s still and some even having upper teens in the 2009-10 winter. I posted this in another thread but here is the lowest temperatures I have recorded in recent years. Christmas 1989 had 2 nights around 19-20F. Since then the coldest it has been in Orlando is one night down to 26F in Feb. 1996. Dec. 2000 had a night at 27F and one at 28F. Jan. 2003 had a night at 27F. Then there was the long cool winter of 2009-10. Overall lowest temperature was only 28F one night but there were a dozen other nights between 30-32F. Winter 2010-11 was also a long, cool one but not as bad as the previous. I can't remember the ultimate low, maybe 29-30F. My understanding is that a location’s zone is based on the most recent 30 years of data. So by this measure, 1990-2019, the average is 32.4F, a very solid zone 10a! Orlando. Take a walk around the neighborhoods downtown and in Winter Park and this is very apparent. That said, I think the zone calculation is updated every 10 years, so I think what you will see on the most recent map is still data from 1981-2010. So using this set of data, the average is 30.0F, still barely a zone 10. I have seen some indicators of a zone 10 in Orlando, but with that said, I will put my money on it that it's only a matter of time when Orlando sees a low of ~20F. True, but even so, if that hypothetical 20F low is only a rare occurrence, and most years are like they have been recently, we will remain a cold zone 10a. I personally believe the days of 18F-22F lows are over for Metro Orlando, except for 100-200+ year cold events. The coldest it’s ever been officially in Orlando in the past 125 years is 18F and that was in 1894. Still, 1985 saw 19F. I took a long walk the other night around the neighborhoods north of Colonial Dr. near Bumby and I saw what must have been well over 100 large trunking crownshaft palms. Foxtails, Adonidia, a couple Ptychosperma, Dypsis lutescens, some majesty though not as many as expected and even a couple large royals. Not a single Cocos though. I also saw a number of traveler’s “palms”, large Caryota clumps, among many other tender tropicals getting large and thriving. Winter Park has almost as many of the tropical palms, and what is there is so healthy and well kept due to the wealth of many of the property owners there. Orlando really needs to plant more royals. They should be longterm survivors here now. I know the giant fronds dropping is a consideration though so regular pruning would be needed in common areas. Another thing I noticed in looking at Orlando weather records in the last 100 years is that the traditional winter months (late Nov-Feb) had more consistently cooler weather. In recent years so many times there have been extended stretches of mid/high 80's in winter months like February. For example, the last winter that was as mild as this one in Orlando (1997-98) only got to 39 degrees. And yet- that winter had much more consistent cooler temps than this winter. I know comparing to one year is not accurate- but looking though years of records, I seldom saw such widespread long stretches of mid/high 80's for most of the winters in the 1900's. Also, just in the last couple days, Naples broke it's all time February high for February (the previous record being just last year!) at 90 degrees. If I ever get around to it (doubtful, because of my busy schedule) I want to make a zone map of what I think Florida would look like with a +2F warmup. Part of this comment I started on another thread, but it was turning out to be too big, so I'll post it here. Looking at vintage WDW videos- it has been interesting taking note of the landscaping over the year in the parks in response to climate. I would have thought that they would have been uber-cautious to plant tender stuff right after having been burned so many times in the 80's. I think they did to some extent, and yet in Epcot- I saw footage in multiple years throughout the 80's of newly planted queen palms around the fountain area in Future World including 1990 which would have maybe been the 3rd time replacing them. I guess there was a point where they didn't care and were determined to continue having queens there even if it meant treating them like annuals sometimes. And now today they've come full circle and there are established foxtails there along with other zone 10 plants and palms becoming a staple in all parts of the resort. It seems as if they have been fairly bold in the last 15 years reintroducing zone 10 (even more 10b) landscaping- and fortunately for them, winters have amazingly cooperated (i.e. 6 year stretch of freeze free winters 2012-17). Just like the suddenness and unpredictability of the 1980's freezes, I don't think one could have predicted such a impressive warm stretch in recent years- which goes to show that there was a sizable risk when they started back with such widespread, tender landscaping. And then on the other hand, I noticed a lot of footage from Epcot featuring callery pear trees and weeping willows around World Showcase. Except for one struggling weeping willow, I haven't seen one of either at Disney in the last 15+ years. I speculate that when Epcot was being built, which happened to be during the cold period that started in '77, they just went along and planted more of those northern trees. I daresay that the very few callery pears and weeping willows I've seen in the Orlando area outside of Disney in recent years don't look too hot partially because of inconsistent winter temps with these recent warm winters. Although oddly at the same time- they planted a lot of Ceiba speciosa (floss silk trees) and Corymbia citriodora (Lemon Gum Eucalyptus) in Future World when Epcot opened. I was able to spot the latter on home videos from around 1990 near World of Motion looking like skeletons after the 1989 freeze. And then at the Polynesian- some home video footage from the 80's shows that the backbone of the landscaping was Sabals, Camphor trees, Phoenix canariensis, P. reclinata, queens, and Livistona chinensis (with the latter 3 having damage in some videos after hard freezes). Although I do understand that the big fig tree near the backside of the Great Ceremonial house has been there a long time, although I can't remember if I heard if it was either protected with a heater or killed back to the main trunk in 1989 or thereabouts. 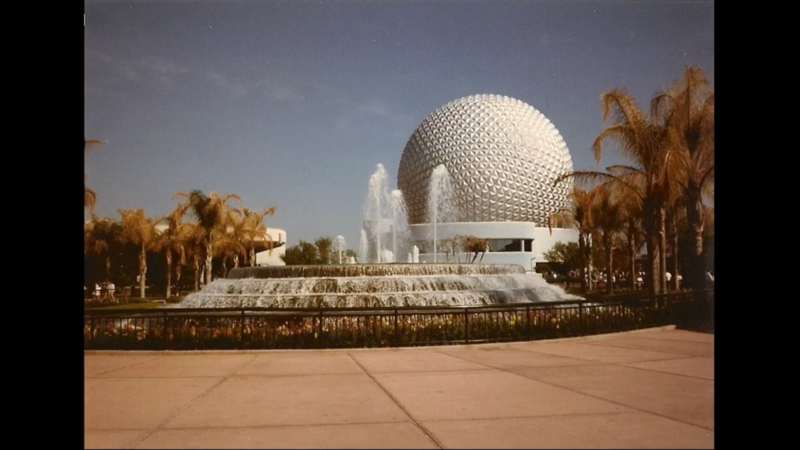 Northern tree plantings at Epcot in the 1980's. Quite an odd sight to see such healthy callery pears there, as nowadays most decent looking ones (at least I've noticed) are about as far south as Gaineseville and north of there (also had them all over the place when I lived in Illinois). Epcot is a great mix of temperate and tropical plantings. A lot of those temperate trees are at the pavilions of other countries so that it gives an atmosphere of that country. Just like replacing tropicals after a bad freeze they will replant temperate plants that wither away after a few years. There is a big Ceiba pentandra at Mexico that has been there since opening and some other oddball tropical trees like Pterospermum acerifolium. There is a big Ficus benjamina in that African themed area between China and Germany and a large Ficus aurea over near the Living Seas. They also planted Clusia rosea by the Living Seas and these survived 2009-10. The big Ficus macrophylla at the Polynesian has been there since it opened. It did have canopy damage but grew back fast. They keep it trimmed nowdays so that the view stays opened. I grew a cutting of this tree around 1994 and it is planted at Leu Gardens and has become a huge tree after 25 years. At at the luau area is a big Ficus aurea encircling a Sabal palmetto. In regard to the average annual extreme low in Orlando, I just found this climate chart which shows is from 1892-current as 29.4F. As mentioned, based on the past 30 years of data, the annual average extreme low is 32.4F.